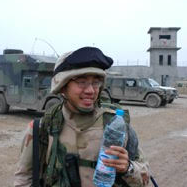 Baldwin “Bobby” Yen is the son of Taiwanese immigrants and joined the U.S. Army Reserve in 1998. As a Public Affairs Broadcast Journalist, he was deployed to Iraq in 2003. Bobby served in both Northern Iraq and then the Baghdad area. He currently resides in the Los Angeles area and works in the video game industry.